good sound and all fonctionnal! i have to learn a new way of mixing cause it's diferent from my past mackie lm3204 (rackmounted). i need to clean the inside cause there are some scratchy and hard pots; i was wondering if it was a good thing to add some mutes on some channels when i'll open her? i see two way of doing this: unsoldering the (+) of the input jack of each channel and add a simple switch on/off? it may work? 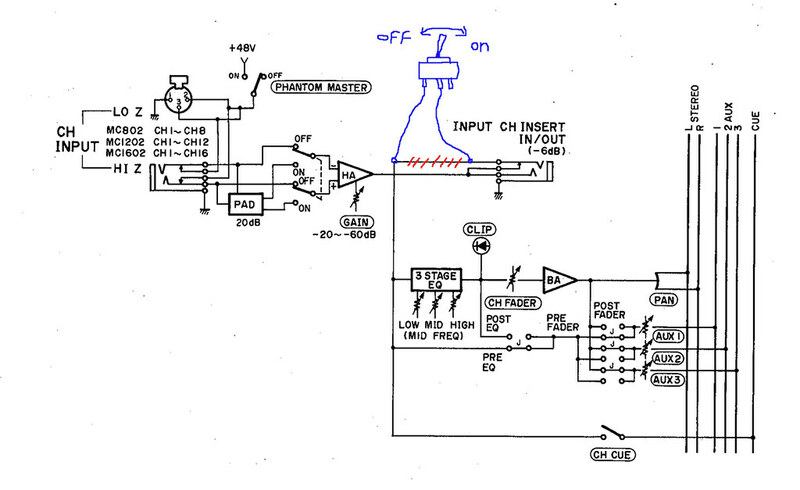 or add this on/off switch directly at the fader output (middle pin)? anyone did this before? i'm totally crazy or it is so simple as i wrote it? or like this ,maybe it's better, it's like wiring insert out to nowere, so no sound? Yep! i think it's better in pre-aux cause the mute i imagined was here to send signal to delay in a more brutal way than the faders. Anyway i'll see clearly the better way to implant this switch when i'll open the mixer; i don't want to make fatal mistakes while soldering the thing so it must be easy to do...if not i prefer abandon this add mute and work with the faders, afterall it works too! where to drop in a switch? I would open a piece of PCB trace and solder in place a pair of jumper pins that a push-on connector could lead up to a switch. If you decided to delete this "feature", push a jumper over the pins on the PCB and tape over the hole in the panel. Add a note to the user manual about this PCB "feature". Where? Between the clip indicator and the channel fader. The clip indicator might continue to work (?) which could be useful. I'd try this mod before drilling the panel to see if it is going to good/useful. To control the Aux pre-post-open(mute) status, do the same thing with a push-on connector using the pins already on the board. Most channel strips are pretty packed with controls already. If the mixer is short-loaded, a blank panel might be used to hold these kind of switches. The usual cautions apply. Mod's are best accomplished while unplugged from mains voltage. Good holes in sheet metal are made by drilling a small hole with a sharp bit and using a 2-sided punch, like those made by Greenlee. Not cheap! Be careful to not let metal get near any electronic circuits or remain inside the chassis. Value of the mixer/channel will be negatively affected by modification unless you make a platinum record with it. This is an INSERT line! Just build an insert jack with a switch on it to open the tip and short the ring to the sleeve. Everything quiet, including Auxes, unless you can get your EQ's to oscillate (joke only!). that with us (mostly) non-professional enthusiasts!! reverbs,anything) than a mute button, right? fader like rufus13 initially proposed- it would be the best in my opinion. Yes, the channel insert jack is a useful thing for adding effects if you have lots of them. If you don't have many effects, use the Aux inserts and the buss inserts. Even pretty basic 8x4x2 mixers (like Soundcraft 200-series) have 4 real-fully-functional Aux's, and some give the option of almost 6 (3&4 are switchable to 5&6). For dub and high-effect count styles, several small mixers can be more useful than the same number of raw inputs in one mixer because of the immense routeability inside each desk. For location events, an 8-input mixer (or 3) is front-seat portable where a 24-input mixer is too big/heavy. Tape and popsicle sticks can "group" adjacent mute buttons if they are the push kind. Are any of you using 1U quad gates as channel mutes controlled by sidechain? Used gates are cheap and fun. +yes analog is the path scattered with lots of fx..